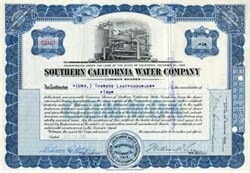 Beautifully engraved certificate from the Southern California Water Company issued in 1948. This historic document was printed by the Security Bank Note Company and has an ornate border around it with a vignette of water pipes. This item is hand signed by the Company's Vice President and Assistant Secretary and is over 56 years old. American States Water Company is an investor-owned utility publicly traded on the New York Stock Exchange under the trading symbol AWR. 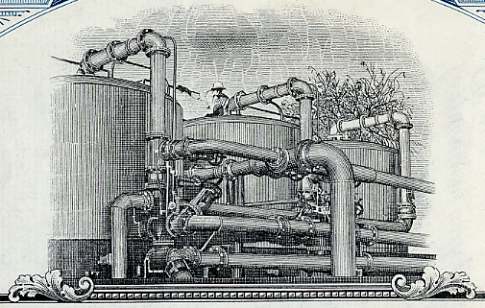 Through its subsidiary companies - Southern California Water Company and American States Utility Services - American States Water Company provides water delivery, wastewater treatment, customer billing, 24 hour customer support, and meter reading services to approximately 330,000 customer accounts throughout California and northern Arizona.